Unparalleled improvements in diagnostic imaging have occurred over the last several decades. Until the 1960s, radiographs were the only technique available in this field. In time, however, more sophisticated imaging methods were gradually added to the diagnostic arsenal, and even radiographs have entered into the digital arena. Each of these imaging methods has singularities to be considered in the assessment of immature joints, and both the radiologist and the requesting physician must be familiar with them. The requesting physician is supposed to have an open-minded and receptive attitude, consulting with the radiologist whenever a doubt arises (e.g., “which imaging method is the most appropriate for this patient in this specific clinical setting?”) and providing all the relevant information for each case. Accordingly, the radiologist must perform the requested imaging study and interpret the findings under the light of the clinical picture. Analyzing the images without taking the clinical background into account is dangerous and may lead to an erroneous – and potentially catastrophic – diagnosis. 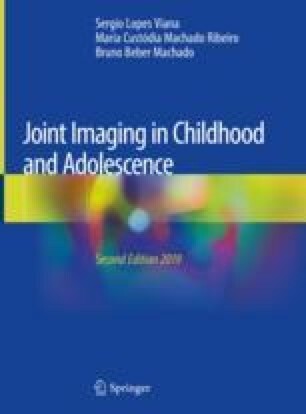 This chapter is a brief introduction to the most important imaging methods used in the investigation of the immature joint, emphasizing their peculiarities in pediatric patients. It is important to keep in mind these imaging methods are complementary instead of exclusive, acting synergistically when properly combined.